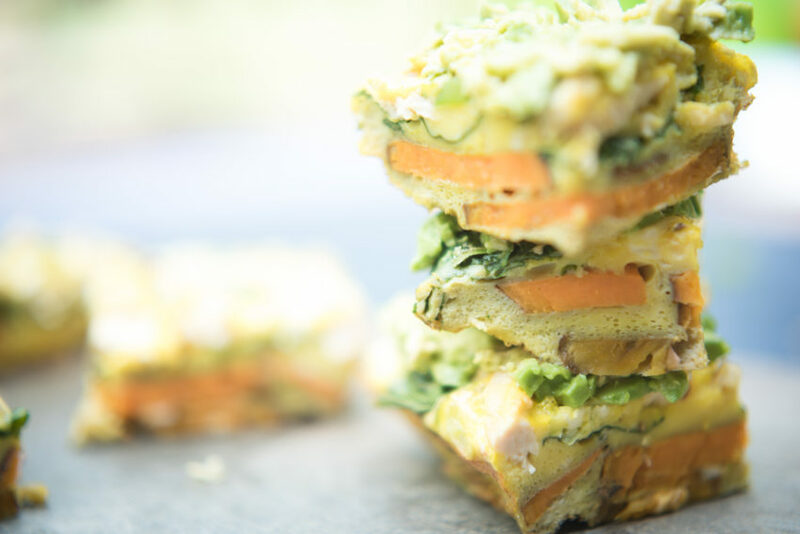 I was asked to create a healthy breakfast casserole recipe – but one that was low in carb, and sky high in protein. It reminded me how I had a patient tell me once that her doctor said, “if she were going to eat a white potato, she may as well eat a donut.” What?!?!?! That’s like comparing a pound of bricks and a pound of feathers, and saying they are both the same because they are both a pound – without acknowledging the other factors that make them entirely different. A potato comes from the earth – has fiber, tons of minerals in the skin, and, for some people, energy-giving carbohydrate. Carbohydrate is not bad – there are certain forms of it that are not good (refined sugar), but one of the nutrients you need most comes from carbohydrate – fiber. Though I don’t have a problem with eating a white potato depending on how it’s fixed (hello, Baked Fries! – the best recipe for those of us with a salty-tooth), a sweet potato has even more nutrients and fiber. So, that was my choice for the base of this “casserole” (if you can call it that). I wanted to create something with fresh ingredients – no cans nor boxed products, but still just as easy. Did you know that when you cut a sweet potato, enzymes are released that help to protect the sweet potato from damage. And…when we eat those, they are some of the very nutrients that protect our cells as well. Pretty cool huh? 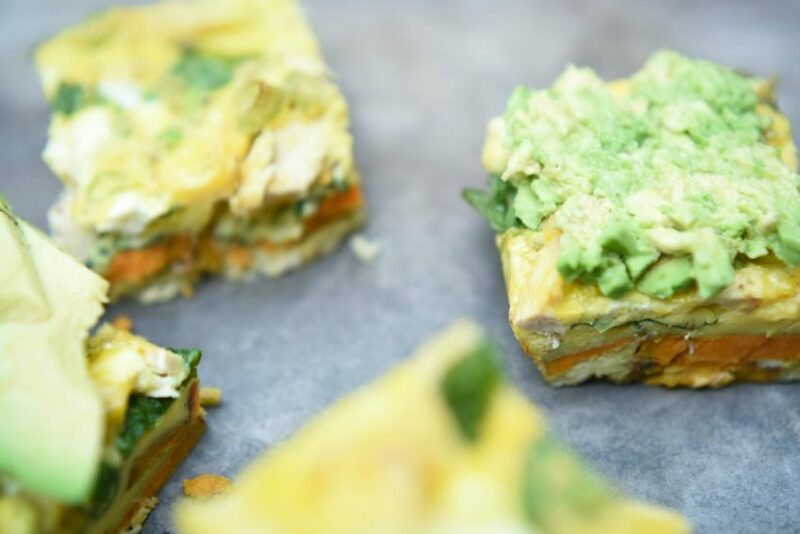 Pour in 10 beaten eggs, bake again, and here you go! I love to top this with smashed avocado. One of the best things about these are that it is a protein-packed meal with only 125 calories and 12 grams of protein per square. They do taste best right out of the oven, but I found that they freeze okay as well. I wanted this “breakfast casserole” to have a entirely different set of delicious flavors. Yup, it worked! I know a recipe works when it passes 2 tests: my 4-year old little boy, who ate 4 squares right away after I tested it one night (can you blame him? He’s a growing boy who needs his protein:), and my weight loss patients – who have an entirely different set of tastebuds than my children. They both loved it! I admit, it probably makes a better breakfast-for-dinner than it even does a breakfast-for-breakfast. Either way, eat your protein, and your good carbohydrate…called fiber! How do you like a breakfast casserole? I love gathering inspiration from others. Make today an energized one! I created these Sweet Potato Breakfast Squares for Albertsons, Safeway and the fantastic O Organics™ brand. 1. Spray an 8×8 pan with nonstick spray and preheat oven to 350º. Place sliced sweet potatoes in the pan. Spray with with nonstick spray (or 1 teaspoon olive oil), and toss with 1/4 teaspoon kosher salt. 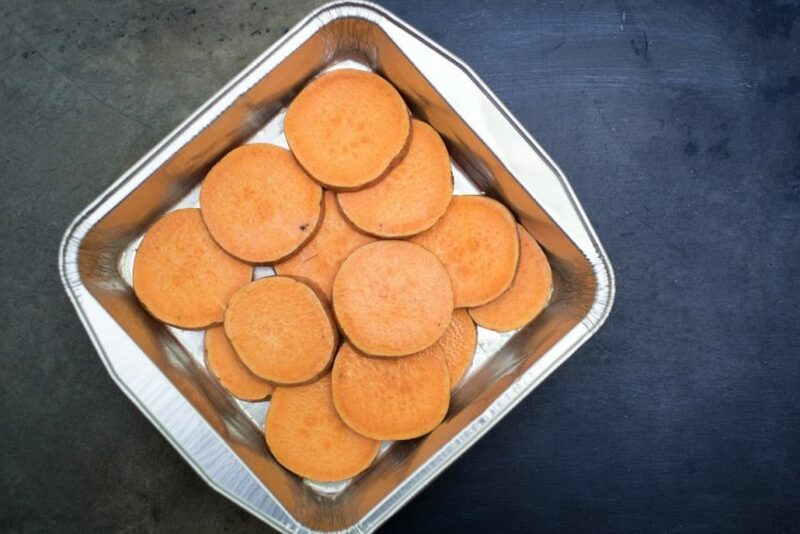 Arrange sweet potatoes so they line the bottom of the pan, but it is fine if they overlap a bit and are slightly stacked. 2. Bake sweet potatoes for 30 minutes. They will be soft & fork-tender. 3. 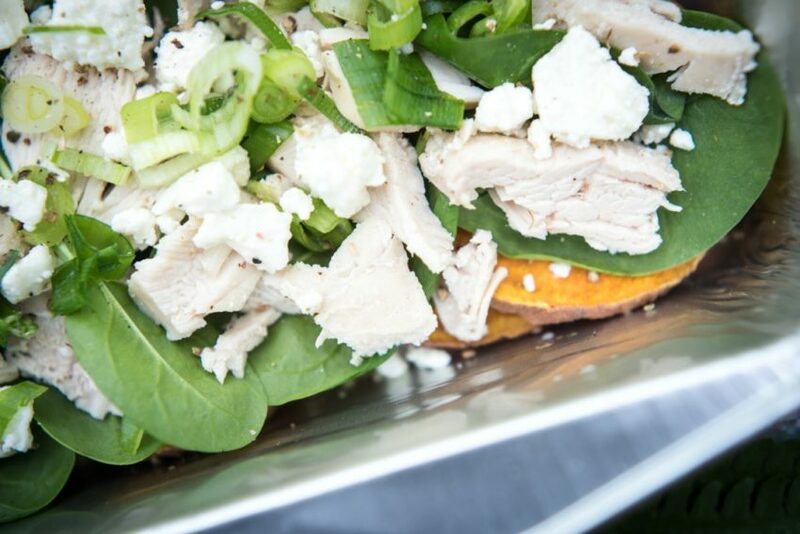 Remove pan from oven and layer other ingredients on top of the sweet potatoes: fresh spinach, shredded chicken, chopped green onions, then feta cheese, sprinkling all over. 4. Whisk eggs with 1/4 teaspoon kosher salt for 1 minute, then pour them over everything. Bake for another 30 minutes, just until eggs are set. 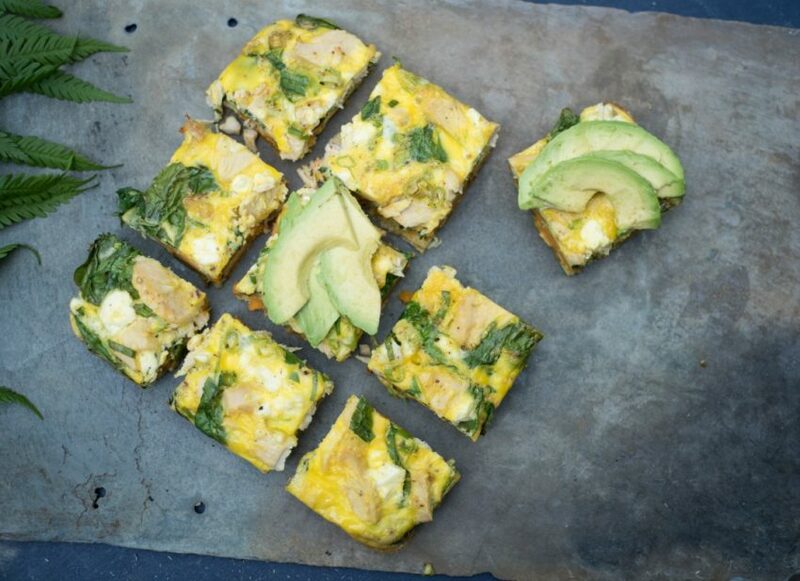 Remove and cut into squares to serve! Top with creamy avocado and chop chives if desired. – you could also use 4 ounces frozen spinach if you do not have fresh spinach on hand. Just thaw the frozen spinach and squeeze out some of the moisture. – you can use any cooked chicken you have on hand; for example, grilled chicken from dinner the night before would work great in this recipe. Chicken that has been cooked and seasoned lightly is best. – adjust the cheese to your liking; fresh Parmesan, shredded sharp cheddar, or shredded white cheddar would all be great choices. This looks delicious – lots of eggs though. If I were to substitute egg whites how many would you use? I love this recipe! It has “breakfast” in the title but it is so delicious and nutritious that my family enjoys it anytime. One of my top 10 favorite recipes on this site!